It has now been a couple of weeks since my family returned from this summer’s National Park adventure! 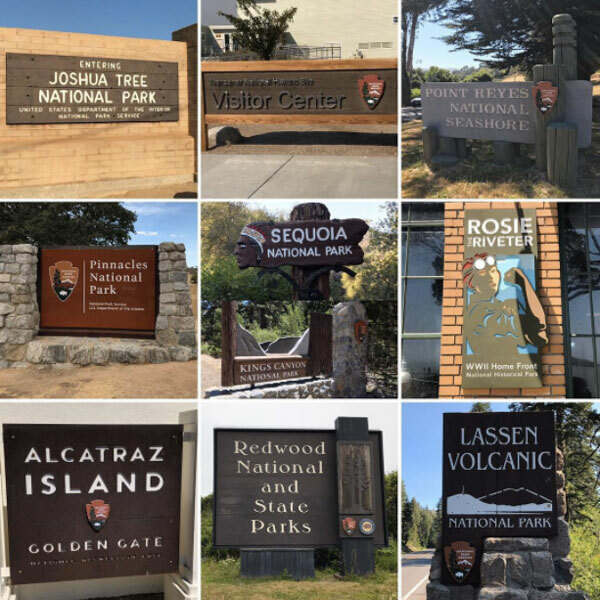 This summer, my family’s National Park adventure was split up into 3 parts: Visiting National Parks in Southern California, a Family reunion near San Francisco, and visiting National Parks in Northern California. In the 16 days, we saw so many amazing sites from the largest tree on Earth, to the most notorious prison. In all, we visited 10 National Park units! Before we get into the itinerary I want to share with you the video I produced of our California State National Park Adventure. Learn more about this video, “Walking With Giants”, in my post here. As with all my itineraries, this is a fairly lengthy post so before we get started I wanted to say a few things to note. 4. We didn’t visit Yosemite National Park because we have already visited it! Read about it here! Our vacation started with a super early flight from Raleigh to Los Angeles. Even though it took us 7 hours to get there, we gained back 3 hours making both a ridiculously tiring day but additional sunlight to squeeze in a park on the first day! Note: If you only have a couple of hours at Joshua Tree, do these 2 sites. Barker Dam Trail is an easy hike that highlights the boulders, desert sand, and Joshua trees. Keys View is a viewpoint that you can drive up to. On a clear day, you can see the San Andreas Fault! Note: This is a must-see National park unit. It is not easy to get to as you must drive around the mountains in Sequoia National Park to get to it but it is such an important piece of American history. I will be writing a fuller post about this unit soon. Note: There are so many things to see and do at this park and we did most of it in one day! We DID NOT get to the Visitor Center in time to secure tickets for the caves but we still had so much to do including over 10 miles of hiking seeing these massive trees! – Kings Canyon Scenic Byway into Kings Canyon, where several vista point turnouts reveal the grand and dramatic scale of North America’s deepest canyon. Note: Kings Canyon is like Canyonlands National park: it offers diverse attractions with trees, a river, and snow capped mountains. You will see that the National Park Service website always ties Sequoia with Kings Canyon. This is because both parks are managed by the same office and they also share a shuttle service. Note: Pinnacles National Park has two entrances and they do not connect. We only had enough time to visit one entrance so we chose the West entrance. This is because I had earmarked the Balconies Cliff/Cave Loop. It was worth it! Pinnacles is the newest National Park and it shows a bit. The infrastructure needs more development. The road was only one lane heading to the entrance and the Visitor Center was not staffed. We spent the next 3 days at a family reunion near Point Reyes National Seashore. Note: The lighthouse is a strenuous hike and it’s well worth it. That being said, the drive is about 40 minutes from the Bear Valley Visitor Center and if you don’t get there early you will have no parking options. Go early or on weekdays! We spent Sunday visiting the Rosie the Riveter WWII Home Front National Historical Park. It explores and honors the efforts and sacrifices of American civilians on the World War II home front. It was a short 30 minute drive from my parent’s house in Sausalito, CA. Note: This is a site that you can do in a couple of hours. There are interactive exhibits and an informative film. One of the must-see things for this trip was to visit Alcatraz Island. The problem is in the summer months, it is impossible to get tickets as a walk-up. Fortunately, I am a planner and I booked tickets 5 months in advance! It was well-worth the effort and I will be posting on the experience in a separate post soon! We spent the next 2 days visiting Redwood National Park. The drive was very long from my parent’s homein Sausalito, CA. It took us 5 1/2 hours to get to Eureka, CA where our hotel was. Note: We made a wise decision to stay in Eureka, CA. The city had great restaurants and convenient grocery stores for us to visit to pack our lunches for days filled with hiking. There are very few options near the park which is 1 hour North of Eureka. So I had originally planned on visiting Lasen Volcanic National Park on this day but 2 major things happened: the drive from Eureka, CA to Redding, CA was waaaaaay longer than I anticipated. Hours and hours of windy roads with no GPS signal and road construction as crews were working to secure mudslide areas meant a change in schedule. In addition, we had a snafu with our rental minivan when we got to Redding so I called an audible and we spent the weekend at Turtle Bay Exploration Park. This was a great choice! It features a museum, a small zoo, and an iconic Sundial Bridge. It was a nice break from the miles of hiking that we did the previous 2 days! We moved Lassen Volcanic National Park to Friday and then we hit another snafu. I had wanted to hike Bumpass Hell Trail at Lassen Volcanic but it was closed because of snow. Snow! In the middle of July! We still enjoyed it though! Note: The Rangers mentioned that the SUlphur Works display showed some of the same geothermal attractions that Bumpass Hell Trail showed. It was a short 1/4 mile up the road from the Visitor Center and we managed to catch a Ranger tour which was worth the effort! A Vacation We’ll Never Forget! We had a fantastic time in California! We drove all over California logging over 3700 miles in the rental minivan! There is nothing I love more than going on adventures with my family! We have now visited 88 National Park units! Only 12 more to achieve our goal! Have you visited any of these National Park sites! Which is your favorite?